After a major restoration in Newport, Rhode Island, the 1930 sailing yacht Dorade is set to return to ocean racing in June. The refit, which took the best part of 2011, entailed work on virtually every component and detail of Dorade from the hull frames to the engine, spars, rudder, electronics, sails, rigging, custom winches and headstay tang. Her whole interior was also refurbished, with full-size mock-ups made of certain areas in the process. Built in 1930 at the Minneford Yacht Yard in New York, the 15.85m Dorade is the yacht that made Olin Stephens' reputation as a world class designer. She was a hugely successful racer, winning both the Transatlantic race and the Fastnet in 1931, and the Fastnet again in 1933. The Bermuda Race was one of Dorade’s first ocean races and she came second in class in 1930 and first in class in 1932, and was also victorious in the 1936 San Francisco-Honolulu in the Pacific. The Times described her as 'the most prodigious small ocean racing yachts ever built'. In more recent years she finished second in her class at the Vele d'Epoca in Imperia, and in 2003, Olin Stephens, who was over 90 at the time, competed aboard her in the Régates Royales at Cannes. Dorade is now being prepared to return to the ocean racing she so excelled at, starting with the 2012 Newport-Bermuda Race on 15 June. Prior to that she will be tuning up in the Caribbean, partaking in various regattas - on her list is the Heineken Regatta in St Maarten, followed by Les Voiles de St Barths and the Antigua Classic Yacht Regatta. 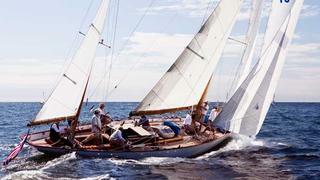 Dorade will also be present at the St Barths Bucket superyacht event. Captain Alex Greenson joined Dorade in January and will be preparing her and her new crew for the regattas, with shore support from Mike Drake of MCM Newport. Other core members of Dorade’s crew include John Burnham, Buddy Rego, Pam Rorke Levy, Christopher Musler and James A Hilton Sr, with the final crew list yet to be announced. Dorade’s owner and team-leader, Matt Brooks, whose home waters are the Bay of San Francisco, is a world-renowned mountain guide and has racked up first ascents in the Sierra and French Alps. He also flew solo aged 13 and set a record time for circumnavigating the globe (westward) in a jet plane. He is the reigning 6-metre class, vintage division, world champion.